Alexander Mikhailovich Rodchenko (Russian: Александр Михайлович Родченко), December 5 [O.S. 23 November] 1891 – December 3, 1956) was a Russian artist, sculptor and photographer. He was one of the founders of constructivism and Russian design. Constructivism was an artistic and architectural movement in Russia from 1913 onward (especially present after the Russian Revolution of 1917) which dismissed "pure" art in favor of art used as an instrument for social purposes, namely, the construction of the socialist system. The term Construction Art was first used as a derisive term by Kazimir Malevich to describe the work of Rodchenko in 1917. Constructivism first appears as a positive term in Naum Gabo's Realistic Manifesto of 1920. Constructivist artists attempted to create a new type of utilitarian art that would help educate the masses into the proper socialist sensibility and inculcate the values of the newly emerging Soviet socialist system. Like a lot of avant-garde movements of the era, it attached itself to the fledging Soviet state, but would ultimately come to be rejected during the era of Stalinism, as the more kitsch style of socialist realism gained ascendency over the more revolutionary avant-garde approaches. Rodchenko was one of the most versatile Constructivist and Productivist artists to emerge after the Revolution. He worked as a painter and graphic designer before turning to photomontage and photography. His photography was socially engaged, formally innovative, and opposed to a painterly aesthetic. Concerned with the need for analytical-documentary photo series, he often shot his subjects from odd angles—usually high above or below—to shock the viewer and to postpone recognition. He wrote: "One has to take several different shots of a subject, from different points of view and in different situations, as if one examined it in the round rather than looked through the same key-hole again and again." 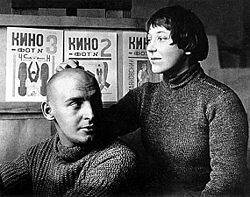 He was married to the artist Varvara Stepanova. Rodchenko was born in St. Petersburg to a working class family. His family moved to Kazan in 1902 and he studied at the Kazan School of Art under Nikolai Feshin and Georgii Medvedev, and at the Stroganov Institute in Moscow. He made his first abstract drawings, influenced by the Suprematism of Kazimir Malevich, in 1915. The following year, he participated in "The Store" exhibition organized by Vladimir Tatlin, who was another formative influence in his development as an artist. Rodchenko was appointed Director of the Museum Bureau and Purchasing Fund by the Bolshevik Government in 1920. He was responsible for the reorganization of art schools and museums. He taught from 1920 to 1930 at the Higher Technical-Artistic Studios or VKhUTEMAS (Russian: ВХУТЕМАС, Высшие художественно-технические мастерские. It was the Russian state art and technical school founded in 1920 in Moscow. In 1926 its name was modified: "Institute" instead of "Studios" (ВХУТЕИН,(VKhUTEIN) Высший художественно-технический институт). It was dissolved in 1930. VKhUTEMAS was closely parallel to the German Bauhaus in its intent, organization and scope. Both schools were state-sponsored initiatives to merge the craft tradition with modern technology, with a Basic Course in aesthetic principles, courses in color theory, industrial design, and architecture. Both schools flourished in a relatively liberal period, and were closed under pressure from increasingly totalitarian regimes. In 1921 he became a member of the Productivist group, which advocated the incorporation of art into everyday life. He gave up painting in order to concentrate on graphic design for posters, books, and films. He was deeply influenced by the ideas and practice of the filmmaker Dziga Vertov, with whom he worked intensively in 1922. Impressed by the photomontage of the German Dadaists, Rodchenko began his own experiments in the medium, first employing found images in 1923, and from 1924 on shooting his own photographs as well. His first published photomontage illustrated Mayakovsky's poem, "About This," in 1923. From 1923 to 1928 Rodchenko collaborated closely with Mayakovsky (of whom he took several striking portraits) on the design and layout of LEF and Novy LEF, the publications of Constructivist artists. Many of his photographs appeared in or were used as covers for these journals. His images eliminated unnecessary detail, emphasized dynamic diagonal composition, and were concerned with the placement and movement of objects in space. Throughout the 1920s Rodchenko's work was abstract often to the point of being non-figurative. In the 1930s, with the changing Party guidelines governing artistic practice, he concentrated on sports photography and images of parades and other choreographed movements. Rodchenko joined the October circle of artists in 1928 but was expelled three years later and charged with "formalism," the Soviet slur against artists that it deemed not to be doing the work of the state. (In the Soviet Union, Formalism referred to art that was only concerned with its own artistic concerns, that is, did not have the proper "socially redeeming" content of socialist realism.) He returned to painting in the late 1930s, stopped photographing in 1942, and produced abstract expressionist works in the 1940s. He continued to organize photography exhibitions for the government during these years. He died in Moscow in 1956. Much of twentieth century graphic design stems from the work of Rodchenko. His influence on modern graphic design is pervasive; there are scarcely any important figures and movements which do not owe something to his work. His 1924 portrait of Lilya Brik has inspired a number of subsequent works, including the cover art for a number of music albums. Among them are influential Dutch punk band "The Ex," which published a series of seven inch vinyl albums, each with a variation on the Lilya Brik portrait theme, and the cover of the Franz Ferdinand album, You Could Have It So Much Better. Rodchenko's poster for One-Sixth Part of the World was the basis for the cover of "Take Me Out," also by Franz Ferdinand. Workers' Club, 1925, reconstructed 2007, Van Abbemuseum Collection. "Александр Родченко – Варвара Степанова", Инженеры искусства, изобретатели будущего (Russian language). This page was last modified on 11 November 2016, at 19:00.